A modern classic, the gin gin mule was created by Audrey Saunders of New York City's Pegu Club. It's often thought of as a Moscow mule with gin, though it also has a bit of mojito influence. Either way, you look at it, it's a fabulous drink and one you're sure to love. As the name indicates, there are two "gins" in this recipe. The first is gin—as in the botanical liquor we know and love for everything from the martini to the gin and tonic. The second is ginger beer, that snappy soda that makes the Moscow mule a truly great drink. 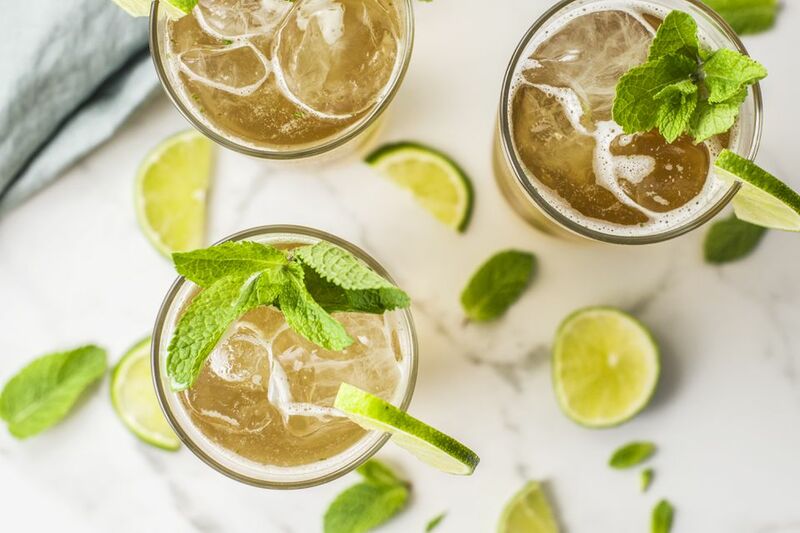 On top of those two ingredients, a little lime, syrup, and mint are muddled, much like the mojito, to give the drink's flavor a refreshing contrast. For today's drinkers, few will argue that Saunders hit a home run with this recipe. It has a great, snappy flavor that will get anyone's attention and it's incredibly easy to make. In a cocktail shaker, muddle the mint leaves with lime juice and simple syrup to release the essence of the herbs. Add gin and fill the shaker with ice. Here's the great news for all you home bartenders: your favorite London dry gin is the preferred style for the gin gin mule. Tanqueray is recommended most often for this recipe and similar drinks, such as the classic Foghorn. This means you don't have to go searching for a particular gin like many other modern cocktails. Just grab that reliable favorite and pour away! The reason for this is simple. Juniper-forward gins—like those in the London dry style—will not get lost in this flavorful mix. You want to notice the gin and taste how it plays off the ginger beer and mint. Juniper is nothing to shy away from and the gin gin mule celebrates it. The ginger beer is going to be your other key ingredient, so choose wisely. It may take some time to find the perfect one for your taste that is readily available near you. However, with the rise in popularity of the Moscow mule, the selection is becoming better than ever! Here, you're looking for a ginger beer with a great spice. They vary greatly and some have more of a spicy kick than others; you want the ones with a punch of flavor and not get lost in the gin gin mule. Quite often, these are the Jamaican ginger beers, though even some of those can be tame. Barrit's is a nice option, as is Q Ginger Beer. Feel free to explore other options as there are great finds waiting if you're willing to gamble on a new bottle. If you take the time to carefully choose your gin and ginger beer, don't blow off this cocktail's mixers. As with most drinks, you'll get a better gin gin mule if everything's as fresh as possible. This means that you'll want to juice a lime—one lime should yield enough for one drink—and ensure your mint is fresh and fragrant. Also, if you don't already, making your own simple syrup will instantly upgrade all of your cocktails while saving a significant amount of cash in your bar. How Strong Is the Gin Gin Mule? Just like most tall soda drinks, the gin gin mule is relatively tame in the cocktail world. With a 2-ounce pour of ginger beer, you're looking at an alcohol content around 10 percent ABV (20 proof). This is similar to enjoying a glass of wine, so it's a perfect everyday drink.